She was first arrested in October 2015 after posting several Facebook statuses, including news information on the rising popular movement and intifada, a photo of Israa Abed and the words, “I am the next martyr,” and her poem, “Resist, my people, resist them.” (Abed is a Palestinian woman, also from ’48 Palestine, who was shot by Israeli police at a bus station; allegations against her were later dismissed.) She is one of hundreds of Palestinians – mostly from the West Bank and Jerusalem, but also from Palestine ’48 – arrested and imprisoned for posting their political positions and, in this case, their art, on Facebook and other social media. Of couse, Dareen Tatour is far from the first Palestinian poet – including a number of poets from ’48 Palestine – targeted by the Israeli occupation for arrest and imprisonment. 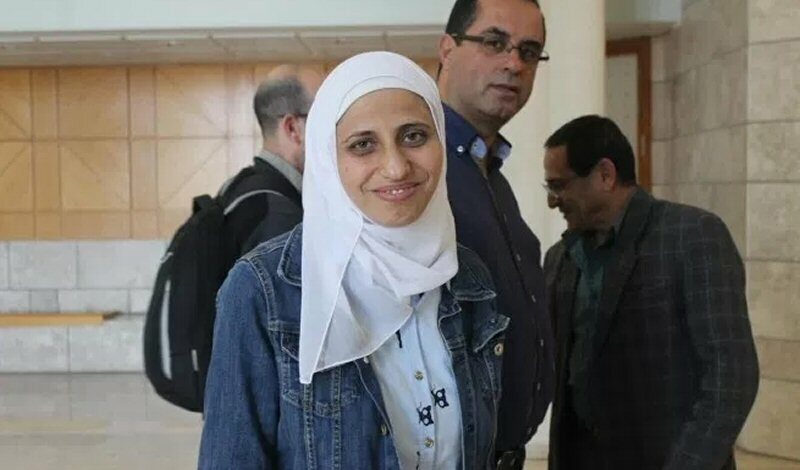 The jailing and trial of Dareen Tatour is an echo of the arrests and imprisonment of Mahmoud Darwish, Samih al-Qasim, Tawfiq Zayyad and many others, not to mention the assassination of Ghassan Kanafani, Wael Zuaiter, Kamal Nasser and other Palestinian poets and writers. Indeed, at times, the trial has been somewhat surreal, as the meaning of words like “intifada” (uprising), “shahid” (martyr) and “qawem” (resistance) are debated in the courtroom between translators. Palestinian existence, expression and experience has become a subject for judicial debate about its inherent “violence.” The very act of a Palestinian writing poetry about her experience and the collective experience of her people is blatantly criminalized and labeled “terror” before the world. After her arrest in October 2015, Tatour was jailed for three months before entering house arrest. Under the conditions of her house arrest, she has been barred from using the internet and communicating electronically. For months, she was restricted to an apartment in Tel Aviv and her brother and sister-in-law had to leave work to “guard” her before she was allowed to return to her home village of Reineh. She was monitored using an electronic ankle bracelet and was denied even visits to her family’s home for months. Her case has drawn attention to the suppression of Palestinian literary and artistic voices. Hundreds of internationally renowned writers and artists, including Edwidge Danticat, Ahdaf Soueif, Alice Walker, Eve Ensler, Ariel Dorfman, Russell Banks and Barbara Hammer, have called for Tatour’s release and the dropping of charges against her, a call endorsed by PEN, the international freedom of expression association. Dareen Tatour has been involved for almost two decades in documentation and mobilizing to remember the Nakba and demand the right of return of Palestinian refugees expelled from their homes and lands. Today, the Great Return March in Gaza and the mobilization of tens of thousands of Palestinian refugees – and the brutal murder of 45 and the wounding of thousands while participating in these marches to the colonial “border” once again highlights the core demand of the Palestinian struggle.